Department of Child Health, Royal Hospital, Muscat, Sultanante of Oman. *Address correspondence and reprints request to: Tawfiq Taki Al-Lawati, Department of Child Health, Royal Hospital, Muscat, Sultanante of Oman. Al-Lawati TT, Al-Musawi HS. Celiac Disease in Oman: A Tertiary Centre Experience. Oman Med J 2013 Jan; 28(1):70-72. Objective: To describe the frequency of encounter of celiac disease in Royal Hospital, Muscat, Oman. Methods: Retrospective study of records of all adult and pediatric patients in Royal Hospital from the period of 1/4/2006 to 31/3/2012. Data regarding symptoms, anthropometry of the patients, haemoglobuin levels, liver and thyroid functions were retrieved. Diagnosis of celiac disease was established based on combination of serological detection of anti tissues transglutaminase (tTG) or anti endomysial antibodies (EMA) with duodenal biopsy. Results: Only 9 children were identified in the hospital during the period of study. Two children were identified by screening protocol for Insulin Dependent Diabetes Melitus (IDDM) and one child from short stature workup. Six children presented with abdominal pain and diarrhea. Four children were severely wasted and stunted. No adult patients were identified with celiac disease. Anaemia was noted in 3 children and none had deranged thyroid functions. Conclusion: Celiac disease is infrequently encountered in Royal Hospital and might be under diagnosed. The low rate of celiac disease in children with IDDM might indicate a different genetic composition. Awareness about celiac disease and family screening should be implemented in Oman. Keywords: Celiac Disease; Arab Population; Oman. This study is aimed at updating information on celiac disease in Oman by providing a detailed review and description of the cases diagnosed in Royal Hospital as the main referral centre for work up of patients suspected to have celiac disease in Oman. A descriptive study of cases of celiac diseases was conducted in March 2012 based on the retrospective review of the electronic records at Royal Hospital. Records of all adults and children diagnosed with celiac disease in the period of 1/4/2006 to 31/3/2012 were identified and included in the study. Data regarding presenting symptoms, age of diagnosis, anthropometric measures, liver functions, calcium profile and hemoglobuin were retrieved from the records. Diagnosis of celiac disease was established by a combination of serological detection of anti tissues transglutaminase (tTG) or anti endomysial antibodies (EMA) and duodenal biopsy indicative of celiac disease. A total of 9 children with an established diagnosis of celiac diseases were identified (Table 1). Complete data were available for 8 children as one child was investigated in another hospital. Females (n: 6) outnumbered males (n: 3). The mean age of these children was 10.9 years (min: 3 years; max: 18 years). The mean age of diagnosis was 7 years (range: from 2-13 years). No adult patients were diagnosed with celic disease. 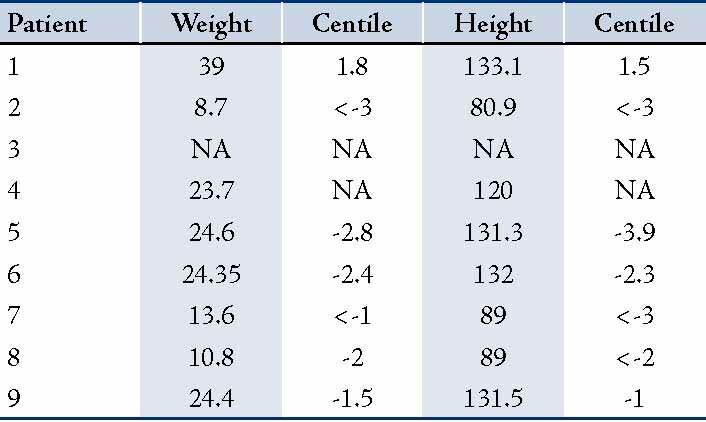 Table 2 depicts the anthropometric data of children at the time of diagnosis. Four children were severely wasted and stunted at time of diagnosis. Clinical presentation was available for 8 children and it included diarrhea (n: 4), stunting (n: 2), and insulin dependent diabetes mellitus (n: 2), (Table 3). All children had endoscopy and biopsy in addition to serological testing for anti tTG or EMA with total IgA. Eight children had histological and serological evidence of celiac disease. Only one child had no histological evidence of celiac disease despite being strongly positive for anti tTG. 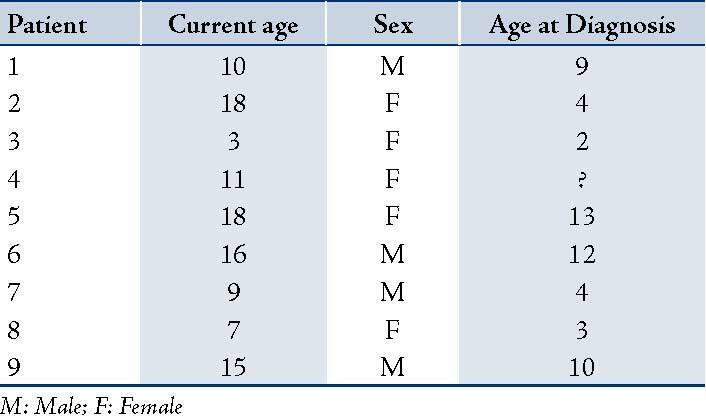 Table 1: Demographic data of patients. Table 2: Growth parameters at time of diagnosis. Table 3: Clinical presentation and means of diagnosis. 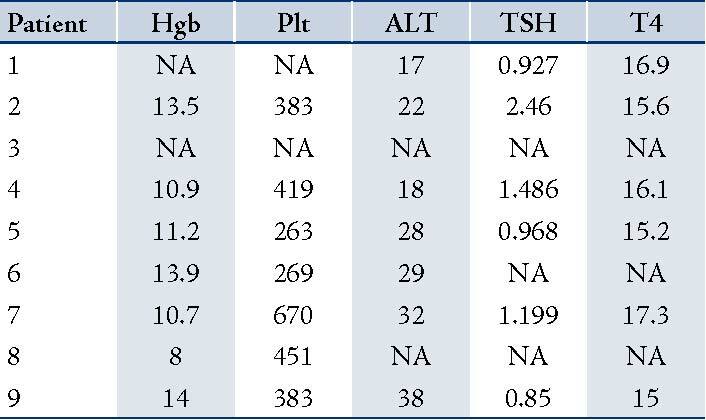 Table 4: Hematological and biochemical results of patients. Oman is situated in the Arabic Peninsula with the Indian Ocean on the Eastern borders and Saudia Arabia and the rest of the Arab countries on the Westerns boarder. Gluten is commonly consumed by the Omani population as a staple diet. Bread and wheat are consumed on a daily basis including weaning foods of infants. This study describes the cases of celiac diseases in a tertiary hospital affiliated to the Ministry of Health in Muscat, the capital city. During six years, only 9 cases were diagnosed with celiac disease at this hospital. This number is similar to that reported by Akinbami in 2006 from Sultan Qaboos University Hospital.10 The data shows that celiac disease is not frequently encountered in the main tertiary hospitals in Oman. The number of children under the age of 14 years in Oman is about 700,000, as estimated by the ministry of health annual report in 2010.11 Considering a prevalence of 0.5 to 1.5%, as reported in neighboring countries of India and Saudia Arabia, the number of celiac disease cases in children in Oman will be between 3500 to 10,000 children. With the crude birth rate of 58,000,11 at least 290 children should be diagnosed annually. Frazer reported 3.3% prevalence in his cohort of adults with unexplained anemia.9 This is very high even compared to both the European populations and the reported data from Arab populations. Potential issues of low frequency of encounter of children with celiac disease might be related to the genetic variance in the Omani population, absence of screening programs of the siblings and possibly unawareness of the referring physicians with regards to the manifestations of the disease. Although there are no data from the rest of the Arabic Gulf countries, celiac disease is not frequently encountered in Kuwait, Bahrain or Qatar (personal communication). The vast difference in the prevalence of celiac disease in children with IDDM and the infrequent encounter of the disease in two major hospitals in Oman might indicate that the genetic predisposition of Omani population is different than the surrounding areas of the Gulf countries with regards to celiac disease. The mean age of diagnosis at 7.1 years in the current study was very similar to the age of diagnosis in Finland at 7.2 years in a single centre study.15 The age of diagnosis at 7 would still be considered late as the disease sets in once gluten is introduced at the age of nearly 6 months. This also may explain why nearly 45% of the diagnosed children were severely stunted and wasted at the time of diagnosis, thus confirming late diagnosis. No obese children were identified. It is also important to note that no adults were diagnosed with celiac disease. This needs to be further studies as it might be an alarming negative finding. Anemia was noted in 3 children at the time of diagnosis. It was not clear if anemia was related to celiac disease per se or is it primarily nutritional iron deficiency anemia. None of the children had elevated ALT or abnormal thyroid function tests. The frequency of encounter of celiac disease in Royal Hospital is extremely low. The low frequency of encounter of celiac disease in Omani children with IDDM might indirectly point towards a low prevalence in the country in general. Inspite of this, there is probably some under diagnosis of the condition in the country as well for various reasons. Awareness of the disease should certainly be increased in the country. 1. Husby S, Koletzko S, Korponay-Szabó IR, Mearin ML, Phillips A, Shamir R, et al; ESPGHAN Working Group on Coeliac Disease Diagnosis; ESPGHAN Gastroenterology Committee; European Society for Pediatric Gastroenterology, Hepatology, and Nutrition. European Society for Pediatric Gastroenterology, Hepatology, and Nutrition guidelines for the diagnosis of coeliac disease. J Pediatr Gastroenterol Nutr 2012 Jan;54(1):136-160. 2. Mustalahti K, Catassi C, Reunanen A, Fabiani E, Heier M, McMillan S, et al; Coeliac EU Cluster, Project Epidemiology. The prevalence of celiac disease in Europe: results of a centralized, international mass screening project. Ann Med 2010 Dec;42(8):587-595. 3. Hill ID, Dirks MH, Liptak GS, Colletti RB, Fasano A, Guandalini S, et al; North American Society for Pediatric Gastroenterology, Hepatology and Nutrition. Guideline for the diagnosis and treatment of celiac disease in children: recommendations of the North American Society for Pediatric Gastroenterology, Hepatology and Nutrition. J Pediatr Gastroenterol Nutr 2005 Jan;40(1):1-19. 4. Abu-Zekry M, Kryszak D, Diab M, Catassi C, Fasano A. Prevalence of celiac disease in Egyptian children disputes the east-west agriculture-dependent spread of the disease. J Pediatr Gastroenterol Nutr 2008 Aug;47(2):136-140. 5. Saadah OI. Celiac disease in children and adolescents at a singe center in Saudi Arabia. Ann Saudi Med 2011 Jan-Feb;31(1):51-57. 6. Khayyat YM. Serologic markers of gluten sensitivity in a healthy population from the western region of Saudi Arabia. Saudi J Gastroenterol 2012 Jan-Feb;18(1):23-25. 7. Sood A, Midha V, Sood N, Avasthi G, Sehgal A. Prevalence of celiac disease among school children in Punjab, North India. J Gastroenterol Hepatol 2006 Oct;21(10):1622-1625. 8. Bhattacharya M, Dubey AP, Mathur NB. Prevalence of celiac disease in north Indian children. Indian Pediatr 2009 May;46(5):415-417. 9. Fraser JS, Woodhouse NJ, El-Shafie OT, Al-Kindy SS, Ciclitira PJ. Occult celiac disease in adult Omanis with unexplained iron deficiency anemia. Saudi Med J 2003 Jul;24(7):791. 10. Akinbami FO, Venugopalan P, Elnour IB, Nirmala V, Abiodun P, Azubuike JC. Pattern of chronic diarrhoea in children: a prospective analysis of causes, clinical features and outcome. Niger Postgrad Med J 2006 Mar;13(1):53-56. 11. Ministry of Health. Annual Report 2010. Muscat. Ministry of health. Directorate General of Planning, Department of Information and Statistics 2010. 12. Camarca ME, Mozzillo E, Nugnes R, Zito E, Falco M, Fattorusso V, et al. A Celiac disease in type 1 diabetes mellitus Ital. J Pediatr 2012 Mar;38:10. 13. Saadah OI, Al-Agha AE, Al Nahdi HM, Bokhary RY, Bin Talib YY, Al-Mughales JA, et al. 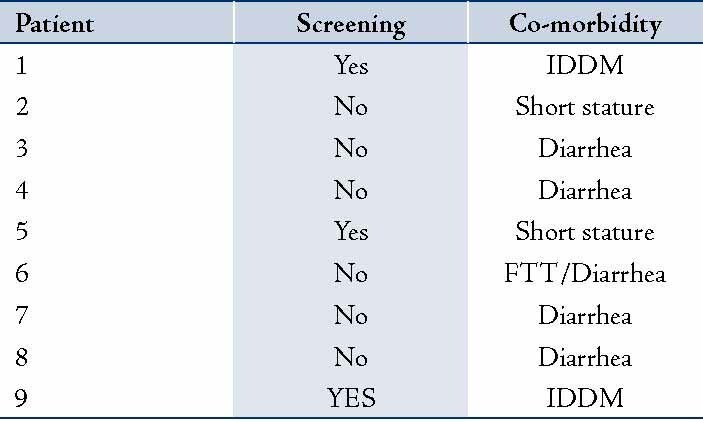 Prevalence of celiac disease in children with type 1 diabetes mellitus screened by anti-tissue transglutaminase antibody from Western Saudi Arabia. Saudi Med J 2012 May;33(5):541-546. 14. Rajab A, Patton MA. A study of consanguinity in the Sultanate of Oman. Ann Hum Biol 2000 May-Jun;27(3):321-326. 15. Savilahti E, Kolho KL, Westerholm-Ormio M, Verkasalo M. Clinics of coeliac disease in children in the 2000s. Acta Paediatr 2010 Jul;99(7):1026-1030.